The first-of-its-kind in the Middle East, IMAX Sapphire by VOX Cinema is an immersive viewing experience with spacious VIP seats. 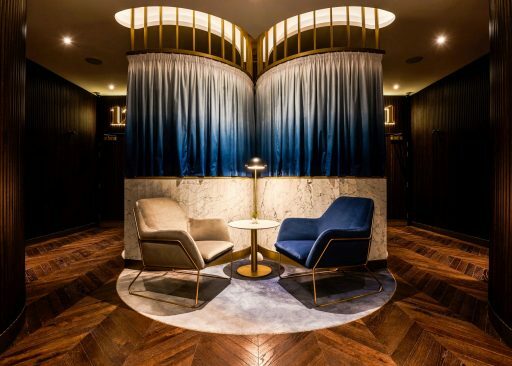 Fitted out by ATS, the cinema interiors appear dipped in a blue hue, through lighting and leather seats in the same colour palette. Stepping inside the VOX Cinemas in Sharjah, you know you have entered luxury. Plenty of gold and chrome interior detailing shines over plush carpeting. The fitout for this project was undertaken by ATS, and the design by UK-based Unick Consulting. Swiss Bureau Interior Design has recently completed the design & build of the Auditorium building in Knowledge Village, Dubai. Orbi is conceptualised to offer an amazing digital experience to its visitors and the entire space revolves around interactive technology. The National Theater of Bahrain project was the subject of an international tender won by the French architects AS.ARCHITECTURE-STUDIO, a practice that already has several references to its credit in the Gulf region. The Meraas Dome Box Theatre offers a unique immersive cinema experience screening both entertainment and educational productions. Bluehaus Group’s inspiration for the interior design and theme was time travel and this is translated and communicated into the environment with key design elements integrated within the dome and surrounding spaces.